An informal, fun-n-meaning page for me, my family, friends, colleagues, and other like-minded people. 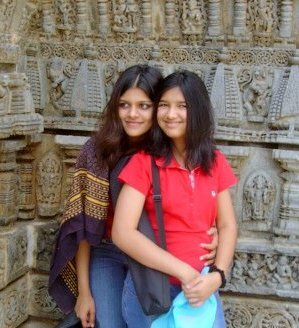 Our daughters Ulrika (1986) and Aria (1993) came along in planned succession after Kiran and I chose to drop anchor in Hyderabad. I don't know what it is like to have a son (except that I troubled my parents the most of all my sibs ! ), but daughters are a real delight. They are so gentle and caring. I am a lucky man. I've been surrounded by women all my life ! First, it was mom and three sisters, now it's the wife and two daughters. I am not complaining. Ulrika's just finishing her sophomore year from Grinnell College in Iowa, USA, and plans to major in psychology. Her CV's only just evolving but to those interested, some info about her may be obtained through a Google or Yahoo search. If you are especially interested, you'll have to type in `Krishnamurti' in all its spelling variations ! Aria's in Class VIII at the Sloka Hyderabad Waldorf School. At the moment, she's just having fun. It is hoped that both girls will start posting messages on this blog soon. 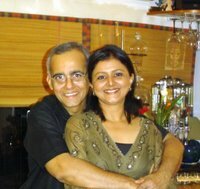 My wife Kiran (nee Hemmady) Krishnamurti and I go back 31 years. I first met her in 1975 at the admission queue of Topiwala (Nair) Medical College in Mumbai. We were just kids then, and have actually grown together since. We `went around' for seven full years with our parents' knowledge and `approval' before tying the proverbial knot in 1982. We moved to Hyderabad in 1985. Kiran and I are best friends first, and spouses and other things thereafter. We also have many common values and interests. These are real pluses if you've chosen to be together until death does you apart ! My wife has many great qualities, as anybody who knows her will tell you. You'll be hearing more about and from her as this blog evolves. 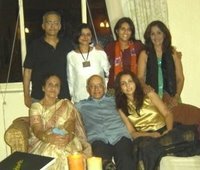 My parents recently celebrated their 50th wedding anniversary in Mumbai, where they live. They have four children, all of whom were present on the occasion. I am the oldest (# 1) and have three amazing sisters (# 2, 3, 4) following me. Being a doctor is sometimes hard, in the sense that one expects you (the doctor) to be always somber and formal even outside of the workplace. It's almost like the doctor's demeanor must match the patient's grave illness. At all times. This, I think is an unfair occupational hazard, albeit sometimes a necessary one. Many doctors are fun people, however, and often possess multifarious interests and skills that are usually unknown outside their immediate circle. More importantly, doctors are human(e) too and make good spouses, siblings, parents, children, and friends. They laugh. They cry. They feel. They hurt. The purpose of floating this blog is to be able to share non-medical aspects of my life with people. It is also a free forum for other doctor colleagues/friends, family, and any other like-minded people to come on in and generally JUST BE ! Noone's watching. And even if someone is, who cares ?! I'm not on my hospital rounds here. This is a page where one can be oneself. Be off guard, be not always your `best', be unpredictable. Be crazy. Post anecdotes from your lives: tender moments, funny happenings, heartrending occurrences. Upload pictures, share your views on this and that. Anything at all really, as long as it retains a personal flavor. Don't cut and paste free-floating internet humor here, for instance. That's not the general idea of a forum like this. So c'mon in guys, and encourage your friends and family to join. Let's just see where this leads. After all, nothing ventured, nothing gained. P.S. : New to me ? Wanna check my somber side out first ?! 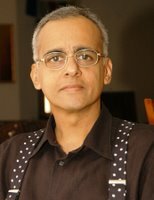 Go briefly to www.sudhakarkrishnamurti.com and come back quick !